The choice of fabrics is one of the most critical aspects of garment customization. Different fabrics are the core factors that distinguish the quality of garments. 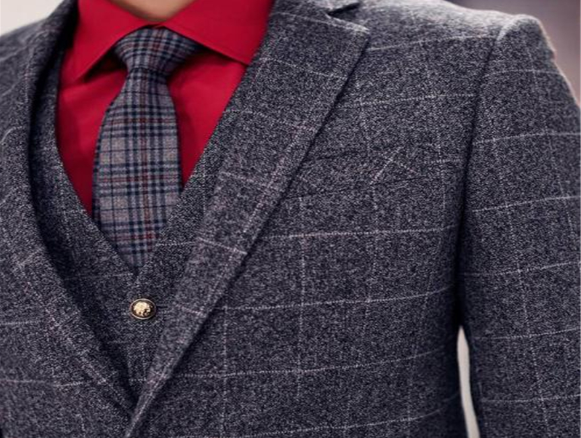 Fashionable Modern Suit Fabrics contain a variety of materials. Fabrics are often made of artificial recycled fiber fabrics and chemical synthetic fabrics. Today I share some common fabrics for suits. Linen fabric is the oldest garment fabric that people have been using. It has the functions of protecting the body and regulating temperature. This natural breathability, hygroscopicity, refreshing and moisture wicking make it a free-breathing textile. Therefore, linen-based clothing is mostly designed without lining, and is suitable for light and thin styles that are directly in contact with the skin. The hand feels soft and elastic, the color is pure, the luster is natural and soft, the texture is exquisite and delicate, the texture is clear, and the drape is better. The fabric is clasped by hand, and it is basically free of wrinkles after being loosened by the gripper. It can be faded in a short time with a slight crease, and it will be restored smoothly. Pure cotton fabric has the characteristics of moisture absorption, moisturizing, heat resistance, alkali resistance and hygiene. So it touches the human skin, making people feel soft and not stiff. The cotton fabric is in contact with the skin without any stimulation, and has no negative effect. It is beneficial to the human body for a long time. Previous: What Are The Characteristics Of School Uniform Fabrics? Next: What Are The Techniques For Color Matching Of Textile Fabrics?